As its origin is china but today its became famous all over the world. 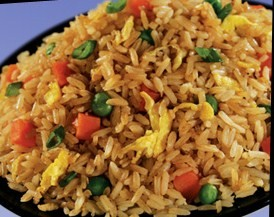 This rice can also tossed with pork, prawn,chicken but here im going to share simply a vegetarian fried rice. Stir fry all vegitbles for 5 min. Again season rice with ajinomoto, salt & black pepper. Serve hot with soy souce ,if needed. Note- all vegitables are half cooked, do not need fully cooked vegitables. It would be nice to sprinkle some chopped spring onion white and green part over the rice before serving. Hi, previously I tried a lot to make chinese fried rice, y'day when I experimented it was really great. Thanks dear. nice taste kirti, but i add tomato, chilly sauce and vinegar so taste are delisiouce. so nice rice dish for party. hi, i think u shud also add a bit of vinegar to it in order to enhance the taste. In this receipe u can add tmto&chilly sauce also & use parboiled rice b'coz while cooking with veg'ble rice will almst done.